3) 1 tsp of vanilla [liquid]. Traditionally my mother would use 1/4 tsp of powdered cardamon, and 2 pinches of ground nutmeg. In a small saucepan put half a cup of sugar. Under medium heat caramelize. Keep your eyes on it, and don’t let it burn. Then in a blender put the eggs, milk, vanilla and 1 cup of sugar and mix well. Then take a glass oven dish [I took a glass loaf pan] and at the bottom place the caramelized sugar, and then the mixture in the blender. Back in a 375 degree oven for 30 minutes or until it solidifies and browns on top. Insert a clean knife and if it comes out clean, that means it’s done. Let cool and refrigerate before serving. My husband loves this dessert and before I had no idea how easy it was to make at home, thankyou so much for this recipe uhkti! JazakAllah khair. Yes, Subhan Allah it’s very very easy. The most delicious of recipes are often the most easiest to make. Wa Iyakum and insha Allah you and your husband enjoy it. Salam. my khameer were a far cry from yours. at first the dough wouldn’t rise and then i added an “emergency dough” (principally the same but half the measurements). It rose but left a somewhat sour taste and only a few of them were hollow. :-( I’ll try in sha Allah again next week. but al hamdu lillah my husband still thanked me for them. Yum! 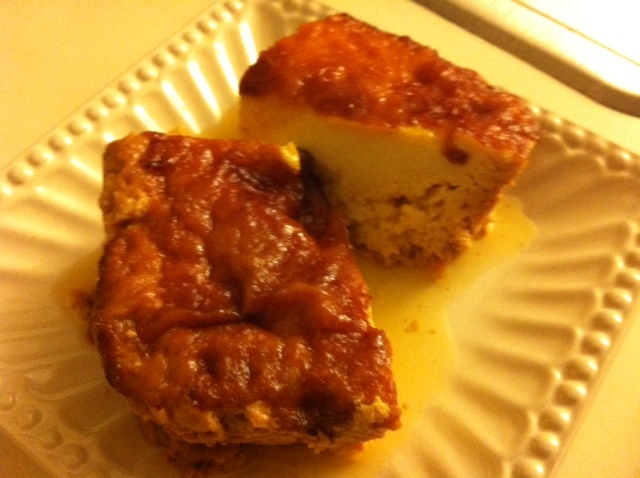 I make something similar but I found a cheat for the caramelized sugar – I “grease” the pan with honey. It changes the taste but I love honey so it works out well. Wow I should try that–I love honey :) Thanks for the idea. Either the vanilla, OR the cardamon and nutmeg. My friend used to just use vanilla, but my Mom used the cardamon and nutmeg [no vanilla]. You can try them, and see which one you like best. does the creme caramel have to be baked by baine marie? You mean in a water bath? No does not have to. I usually just place in an oven without the water bath.